With only two days left until the finale, The Story of Minglan is generating all the buzz on Chinese television. It's a pity that Hunan TV has been slicing and dicing episodes to extend airtime because it feels like ratings and the actual viewing experience could have been so much better it if just aired normally. Being a longer drama, Minglan has outlasted much of its competition and continues to tower above the rest for being the only show with ratings past 1%. Most of the shows left in primetime are newer dramas. National Treasure Legendary Journey headlined by Liu Ye has yet to finding its footing as it has only started airing mid week. 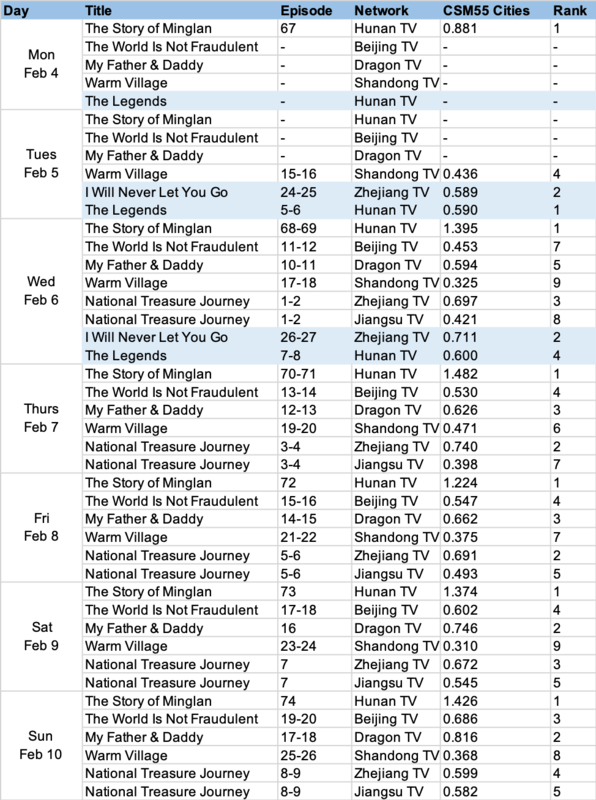 Minglan also ranks in first online followed by I Will Never Let You Go and Legend of Hao Lan. Well Intended Love is a new addition to the top 10 with a syrupy sweet premise and handsome guys. Its lead actor Xu Kaicheng also make the list in 6th place.